After the decline of Satavahanas, many kingdoms emerged in the Deccan. Vakatakas in the peninsular India, were one of them. They were a local power that ruled over northern Maharashtra and Vidarbha. Their history can be reconstructed on the basis of a large number of land grant charters issued to the brahmanas. One of the famous king Rudrasena II of the royal Vakataka family was married to Prabhavatigupta, the daughter of Chandragupta II of the imperial Gupta family. The Vakatakas had tried to build a strong state but it did not last. But the Vakataka kingdom is culturally important because it became a channel to spread brahamanical culture to south India. They were followed by the Chalukya dynasty. Deccan & South in 500 A.D. The Chalukyas played an eminent role in the history of Deccan and south India for about 200 years from the beginning of sixth century A.D. But they became a sovereign power in 540 A.D. and established their capital at Vatapi (modern badami) in Karnataka. The kingdom became prominent during the reign of Pulakesin II i.e. from AD 610 to A.D. 642. He consolidated his authority in Maharashtra and conquered large parts of Deccan. He defeated Harshavardhana in AD 630 and acquired the title of dakshinapatheshvara. It is mentioned in Hieun-Tsang’s account that the Chinese pilgrim also paid tribute to the powers and virtues of Pulakeshin-II. But the Pallavas were becoming powerful in south India at the same time as the Chalukyas in the Deccan. Pulakeshin II fought a battle against the Pallava king Mahendravarman and defeated him. But some years later the Pallava king Narasimhavarman attacked Pulakeshin II and captured his capital city. This was a big defeat for the Chalukyas. However, he himself was defeated and killed by the Pallava king Narasimhavarman in AD 642. It marked the beginning of a long drawn political struggle between the Pallavas and Chalukyas that continued with ups and down for more than a hundred years. Rashtrakutas to the north of Chalukya empire also had been a threat for chalukyas. The Rashtrakutas were ruling a small kingdom in the north-western Deccan. They began their career by being subordinate to the Chalukyas and did not become really strong until the 753 A.D. when they attacked and subdued the Chalukya king. In about AD 757, the Rashtrakutas, overthrew them. Culturally, Chalukya period is important for the growth of art and architecture in Deccan. Pulakeshin II sent an embassy to the Persian king, Khusrao II. A hundred years later, when the Zorostrians left Iran, they came and settled in the towns along the west coast of the Deccan and were later called Parsis i.e. Persians. Zoroastrianism was the religion preached by Zoroaster in Iran some time before 600 B.C. the sacred book of the Zoroastrians is the Zend-Avesta. It was the dominant religion in Iran until the coming of Islam. The southern style of architecture came to be known as Dravida. The chalukya kings built many temples at Aihole, Badami, and Pattadakal. Pattadakal has as many as ten temples built in seventh and eighth centuries. The most famous temples are the Papanatha and Virupaksha temples adorned with sculptures, which represent scenes from the Ramayana. 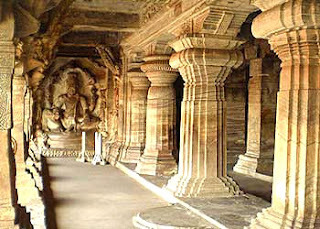 Chalukyas also built cave temples at Badami. A painting in an Ajanta cave shows Pulakeshin-II receiving the ambassador of Iran. Much of the sculpture found at Ellora was due to the patronage of the Chalukya and Rashtrakuta kings. The earliest rock cut temples were excavated in western Deccan in the early years of the Christian era. The first monument of this period is the Chaitya at Karle. The second phase of rock architecture started with the growing popularity of image worship in Mahayana Buddhism, Hinduism and Jainism. The cave temples of Ajanta, Elephanta, Ellora, the mandapas, the rathas of Mahabalipuram and the Kailasa temple at Ellora were some of the great achievements of this period. There are 27 caves in Ajanta. They contain the finest paintings of the ancient times in India. Some of the caves contain extraordinary beautiful images of the Buddha, scenes from his life and from the Jataka stories. At Ellora there are about 35 caves with fine sculptures. The greatest work here, the Kailasa temple is a contribution of the Rashtrakutas. The Pallavas, in far south, probably began as officers of the Satavahana kings. When the Satavahana kingdom declined, the Pallavas made themselves into local rulers and slowly spread their control southwards from the region of Kanchipuram. Kanchi under them became an important temple town and a center of trade and commerce. They rose to power during the reign of Mahendravarman (AD 600–630) and Narasimhavarman I (AD 630–668). Throughout their reign they were in constant conflict with Chalukyas of Vatapi in the north and the Tamil kingdoms of Cholas and Pandyas in the south. They had to fight many wars against the Pandyas and the Chalukyas, both of whom tried to stop the Pallavas from becoming powerful. Pallavas conquered the land to the south of Kanchipuram, Tanjore and the Paddukottai region, because this land was fertile. So Pallavas established their authority over parts of Andhra Pradesh and Tamil Nadu. Their capital remained at Kanchi. Mahendravarman the most famous pallava king was a great warrior, dramatist, musician, and a poet. He was a Jaina to begin with, but was later converted to Shaivism by Appar, one of the Tamil saints. 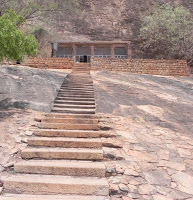 His son Narasimhavarman built cave temples at Trichy and Paddukotai. However he is best known for the rathas of Mamallapuram. Culturally their reign is important for the growth of Tamil bhakti literature and the Dravidian style of art and architecture in south India. It was under them that Mahabalipuram, south of Chennai, emerged as an important centre of temple architecture. Their rule in south India was replaced by the imperial Cholas. The Pallava rulers constructed stone temples in 7th and 8th centuries to house the images of Siva and Vishnu. The most famous are the seven rathas or temples each made out of a solid, piece of stone constructed by king Narasimhavarman at Mahabalipuram, 65 km from Chennai. These rathas are named after the Pandavas. The Ratha is a shrine carved out of a single rock and it looks like a structural temple. The Pallavas also built many structural temples. One of the most important among them is the Kailashnath temple, built of stone blocks, at Kanchipuram in the 8th century. The mandapas at mahabalipuram are excavated halls with finely carved pillars and panels. The splendid panel called the descent of Ganga in Mahabalipuram is a unique rock cut sculpture. The shore temple at Mahabalipuram is located at sea shore and hence it has been called. The twin towers of this temple set in a picturesque background make it an enchanting sight on a moonlight. Though Kanchipuram was the capital of the Pallavas, numerous temples were built there. Two of them stand out prominently. The Kailasanatha temple with its vimana and the numerous panels depicting Shiva as Nataraja and the Vaikunthanatha temple is noted for its vimana and the series of panels depicting the history of the Pallava dynasty. The image was placed in a room at one end of the temple and on the roof of this room there was built a tall tower. In later centuries these towers became taller and taller. People would gather and discuss matters concerning the welfare of the villages, at these temples. Children were imparted education by the teachers in the schools attached to temples. During festivals, discourses, fairs and cultural programmes were held in the temple courtyard. Everyone was not allowed into the temple. Some lower castes and untouchables had their own separate temples. The temple was also very rich and owned lands which yielded revenue. From the wealth it collected it could finance trade as well. In addition to the priests the temple had to have a managing committee to look after its worldly interests. The worship of Vishnu and Siva became popular in south India by saints. They believed that religion consisted of personal devotion or bhakti to god. 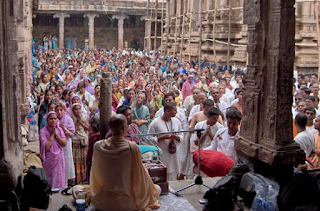 The saints travelled from place to place singing hymns in praise of either Vishnu or Shiva. The Alvars were the devotees of Vishnu and the Nayannars were the devotees of Shiva. From time to time they would recite their hymns. These hymns were composed in Tamil, the language of the common people. Now the Vedic religious texts were understand by only the priests or who were educated. One of the most famous of the Alvar saints was a woman called Andal. The Vaisnava devotional songs are later arranged in a text called Nalayira Prabandham while those of the Saivites are preserved in the text known as Devarama. Hieun-Tsang had visited the city of Kanchipuram and stayed there, for sometimes. Kanchipuram was a centre of Tamil and Sanskrit studies. Dandin wrote in Sanskrit, since they were writing for the court circles and the upper castes. In some respects, the last phase of the ancient period of Indian history (starts in early 4th century A.D. and ends in about 8th century A.D.) was also a period of reversals, which witnessed a gradual decline of towns and trade, of strong centralized state, and the beginning of the system of land grants. These developments, according to some historians/scholars mark the beginning of feudalism in India. In religion this is a period of decline of Buddhism and the rise of Brahmanical religion or Hinduism as we know it today. Idol worship became popular and building of temples on a large scale started. Art inspired by Buddhism also continued, particularly in sculpture and painting. One new thing also happened in this period i.e. the spread of Tantrism in India. From the 5th century the brahmanas had started receiving land in the tribal areas of Nepal, Assam, Bengal, Odisha, central India and Deccan. As a consequence, the tribal elements came to be assimilated in the brahmanical society. The brahmanas adopted their rituals, gods and goddesses. It is this assimilation of brahmanical religion and tribal practices which resulted in the development of Tantrism. It did not believe in any caste or gender bias and admitted both women and shudras in its ranks. It put emphasis on ‘female’ as a source of power and energy. The Tantrik concepts affected, Shaivism and Vaishnavism as well as Buddhism and Jainism which resulted in the introduction of the worship of female deities in these religions. Great progress was made in literature, both religious and secular in Sanskrit which also became the language of the courts in most parts of the country. Tamil literature also made great progress and the Nayanars and Alvars made lasting contributions to it. In spite of the dominant position of Sanskrit in most parts of the country, this period marks the beginning of many modern Indian languages as well as distinct scripts in different parts of the country. By the time the ancient period of Indian history came to a close, India had developed a culture which was marked by features that have characterized it ever since.